Toronto: Hodder & Stoughton, c1920. I read this Scottish novel not in the reprint version shown here, but online via the Open Library -- one of my favourite places to find older, pre-copyright date of 1926 novels. I was reminded to search it out thanks to Leaves & Pages' thoughts on it - it sounded like the kind of cozy read I was in the mood for. Surprisingly, it also dealt with the question of income and a woman managing a family on very little. But this time, it's a little more fairy-tale like, in a pleasing way. Jean Jardine is 23, and prematurely maternal, as she is responsible for her 3 brothers -- 19 yr old David, heading off to Oxford where Jean worries he won't be able to fit in with his wealthy classmates; 14 yr old Jock who is straightforward and lively; and 7 yr old Gervase, an adopted brother who is artistic and typically high spirited for a young boy. They live in a small cottage in the small Scottish town of Priorsford, which is perhaps a wee bit Cranford-ish. The cottage is so lovingly evoked that I wished I could join them in the sitting room for a while. I think you can guess what will happen. But Douglas does not make this seem sentimental and trite -- there is enough backbone to Jean that she takes some convincing, there is a little more work to be done before she'll just fall into anyone's arms, despite the financial benefits. Add to this all the various 'characters' we meet in Priorsford, and the undercurrent of seriousness -- it's just postwar, after all, and people have lost family members, they've lost financial security, and it all affects them. But Jean's essential goodness is rewarded - not by an old woman at a well giving her diamonds falling out of her sweet mouth every time she speaks, but by an unexpectedly legacy which is entirely due to her unselfish kindness unknowingly given to the right person. It feels equally fairy-taleish though! This is a light, enjoyable read, perfect for a few hours of comfort reading. There's Shakespeare, art, community, friendship, fashion, some humour, and of course True Love. As said at Leaves & Pages, this is "a true period piece", set in its own time and revealing its unstated norms throughout. A pleasant look at a good family moving up in the world, even if primarily by chance. There is a sequel, Priorsford, which I will most likely search out the next time I'm in this reading mood. It would be nice to go back for a visit sometime. Yes, a lovely book. I read two other Douglas titles after this one that I did not enjoy as much. 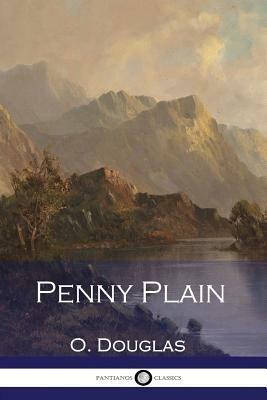 But I didn't know about the sequel to Penny Plain. Nice review! I've heard she's a bit uneven, having written quite a lot -- but I did find this one quite charming. I have, over the past few years, collected all of O. Douglas's books, and dole them out to myself to read at intervals, because they are like good quality chocolates. Enjoyable and delicious, but in smallish doses. She based a lot of her writing on her family life, and wherever there is a little boy, you're reading about her younger brothers, especially the youngest, who died in WWI. Oh, that is such interesting information to have as a background while reading her books! I'm really intrigued by Eliza for Common now. I think it's fascinating that her family had so many writers in it.